Omg, omg, omg. Do I have news for you, my fabulous Gluten-Free Gals! Remember cookie dough ice cream? Yes, one of the yummiest, most cherished ice cream flavors of all ice cream flavors?! Well, now you can have it again! No, this isn’t a cruel and horrible joke. I am a huge snob when it comes to gluten-free food; I only want the best of the best. So, finding a gluten-free ice cream that’s incredibly tasty, super-fulfilling, AND made from organic/all-natural ingredients… difficult. But finding a gluten free ice cream with COOKIE DOUGH CHUNKS, incredibly tasty, super-fulfilling, made from organic/all-natural products… and one that was dairy free too? Yeah… pretty much impossible. 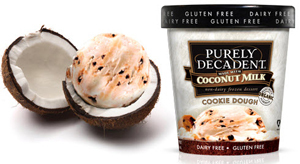 But Glamour & Green Gluten Free found the impossible: Turtle Mountain Purely Decadent’s Dairy-Free AND Gluten-Free Cookie Dough Ice Cream. No, it’s not a lie. The cookie dough is TRULY gluten-free and ridiculously good. Since I don’t have any issues with dairy products, I worried that this ice cream would taste a little odd since it was dairy-free. But who knew that coconut milk sweetened with vanilla and sugar could be one of the most decadent indulgences on the planet!?! It’s also mixed with chocolate flakes. All, I have to say is: Yum. You gotta try this ice cream! So, go grab some GF Cookie Dough Ice Cream today and celebrate! You can even use Turtle Mountain’s Store Locator to find a location that sells it near you. Want to go all out? Try Barkat Gluten Free Ice Cream Cones and lick away! Yay!